In 1939 Germany invaded the Sudetenland; two days later England declared war on Germany and just a week after that Canada declared war alongside the Crown, thus entering what would come to be known as the Second World War. The Canada of 1939 was a small nation, despite its geographical vastness, with a population of just over eleven million, most of whom contributed to a resource economy deeply rooted in agriculture. By the close of the war, Canada had more than a million people serving in uniform (Scott 7). 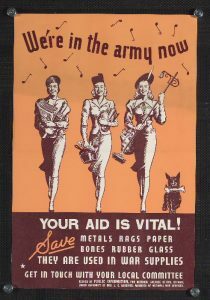 The staggering margin of the nation’s population that were personally invested in the war effort is an indication of the holistic dedication Canada showed during the Second World War. 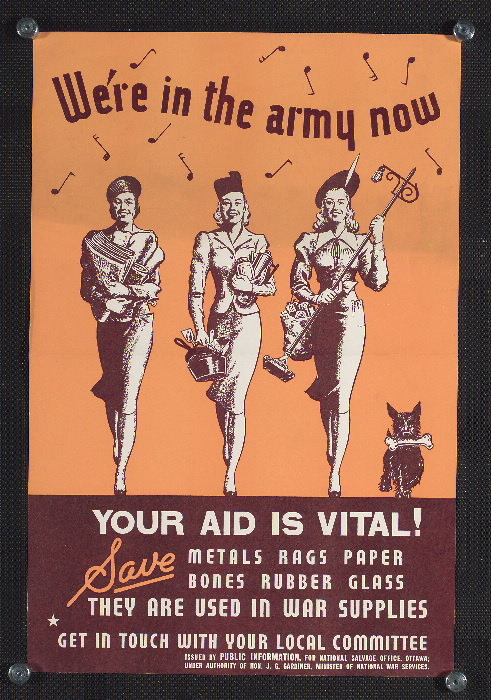 With nearly a tenth of the population serving hands on, Canada, at home and abroad, was truly at war. War is an investment for any nation, and it is an especially dire investment when a nearly a tenth of a nation’s population is personally serving in the effort. For these reasons, on December 6th, 1940, William Lyon MacKenzie King introduced the War Exchange Conservation Act, or WECA, to protect the Canadian economy and aid the dollar. The War Exchange Conservation Act limited imports, specifically on luxury or nonessential goods, and among the paper products banned from the Canadian border were comic books (Kocmarek 148). Among these comic books was Dime Comics, from Bell Features. Dime Comics’ content was a diverse mix of titles, including mysteries, crime stories, single page jokes, comedic strips, and superhero titles, but heaviest on titles focusing on military affiliated action heroes, fighting for Canadian interests abroad. Given that not only was Canada at war but it was that very war which allowed the Canadian Whites to come into existence it should come as no surprise that the ongoing fight features heavily in Dime Comics. In Dime Comics No. 15 alone, six titles, “Rex Baxter”, “ “Hitler” Has… Troubles! !”, “West Wewak”, “Lae Task Force”, “Scotty MacDonald” and “Johnny Canuck”, revolve around the war effort abroad. “Rex Baxter” sees a heroic RCAF embroiled in a strange plot involving mystical figures and science fiction technology, all of which the title character is constantly looking to apply to the war effort. “West Wewak”, “Lae Task Force” and “Scotty MacDonald” all center on fighter pilots and ground troops attempting to advance through the jungles of South East Asia, while “Johnny Canuck” finds the eponymous Canadian superhero stranded in those same jungles, lost and trying to find his way out. Unfortunately, another primary theme present in most of the content of Dime Comics No. 15, is the racialization of villainous figures. Characters of Asian and South East Asian descent are consistently identified as villainous figures and figures of suspicion and deceit, not because of their geopolitical affiliation but rather because of their racial identity. In fact, these characterizations of racial others are not limited to stories set abroad, embedded in the geopolitical conflicts. Within a Dime Comics No. 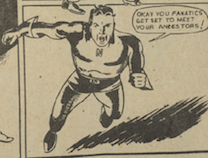 15 “Nitro” story, the titular character, the superhero and masked avenger Nitro, identifies enemy figures as villainous and dangerous because they appear to be Hindu. Given India’s place in the commonwealth and its role as an ally to both Canada and the United Kingdom, the role of race as a determining factor in identifying enemy characters is undeniable. Dime Comics No. 15’s “Nitro” begins unassumingly; Nitro’s mild mannered alter ego, Terry King, receives a visit from a family friend, Carol Fane. Carol informs Terry she has been receiving death threats regarding a ‘Hindoo’ artifact her father, Sidney, has recently recovered from India. Despite the colonial overtones, the first pages of the title are relatively unassuming—that is, until the final frame of the second page, in which Carol is grabbed and hauled into a car by captors whom Nitro characterizes as “foreign looking thugs”. As Nitro begins to pursue the car, he shouts, “OKAY YOU FANATICS GET SET TO MEET YOUR ANCESTORS!” (Lazare 14). Here, Nitro could have identified his enemies by their actions—kidnapping a friend, throwing her in a car and taking off, any number of all round nefarious or suspicious behaviors—but instead its their ethnic identity that he identifies them as antagonists. An identical occurrence can be observed in a military story later in Dime Comics No. 15, “West Wewak”. “Breezy” Bartlett, an RCAF pilot, is flying over the Solomon Islands when he is attacked by a Japanese Zero. Just before ejecting, Bartlett looses a hail of bullets into the Japanese planes, proclaiming “COME AND GET IT, YOU SLANT EYED BABOONS! HAVE SOME GOOD CANADIAN BULLETS RIGHT IN THE PUSS!” (Legault 20). Later, after seeing an American assault on a Japanese base begin, Bartlett attacks a Japanese gunner, yelling “GANGWAY, YOU ALMOND-EYED LITTLE MEN OF BANZAI!” as he does (Legault 22). Again, the enemies of the protagonist are not identified as so by their allegiance to enemy foreign powers—their colors, their insignia, their loyalties—things that may evolve and change overtime, things that may be forgotten after the war, things that are transient and not inherent to their identity, but by their racialization. The Japanese enemies of ‘Breezy’ Bartlett aren’t portrayed as his enemies because of their imperial mandate, the cruelty of their policies, or any other more nuanced reality, but because of their features which are inherent to their race: their Asian eyes, their Japanese stature. The message is clear: Bartlett’s enemies aren’t his enemies because they serve the Axis, but because they are the Axis—as evidenced by their racial features. Later, on page 29 of Dime Comics No. 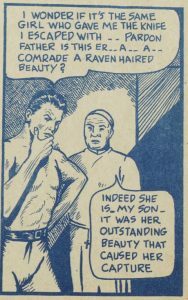 15, a “Scotty MacDonald” story features the titular hero and an American ally, Jim O’Hara, sent to rescue a Chinese allied agent. Once they’ve rendezvoused with their man, Sin Tong, Jim says to Scotty, “THINK HE CAN BE TRUSTED SCOTTY. [sic] HE’S A MYSTERIOUS LOOKING CHAP. HE MAY NOT BE THE M’COY!” (Cooper 30). 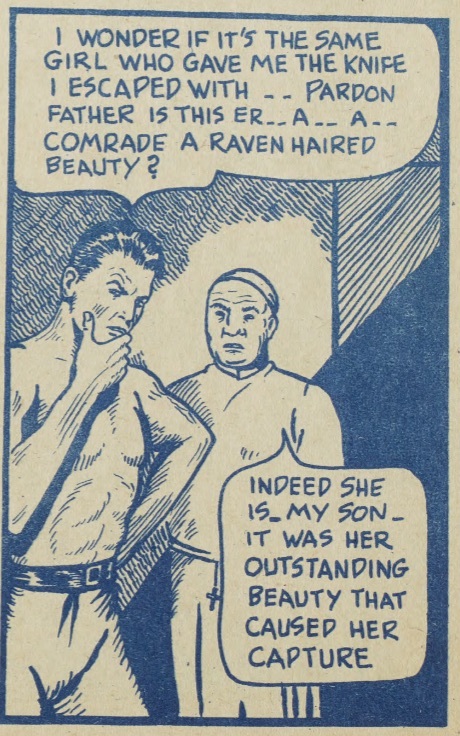 One might expect the portrayal of Chinese people in Dime Comics to be more sympathetic, given their role as an ally (not that this prevented racist depictions of Indian people), yet again a character expresses sentiment specifically centering on an Asian person’s appearance. His behavior, his credentials, these things which any reasonable person would judge another person’s character, are secondary to the man’s racial identity. Paired with the racist caricature of Japanese soldiers which follows in the remaining panels of “Scotty MacDonald”, an opportunity for a positive representation of Asian characters is passed upon, and even an allied soldier is portrayed as rather shifty because of his Chinese appearance (Cooper 32). The final title of Dime Comics No. 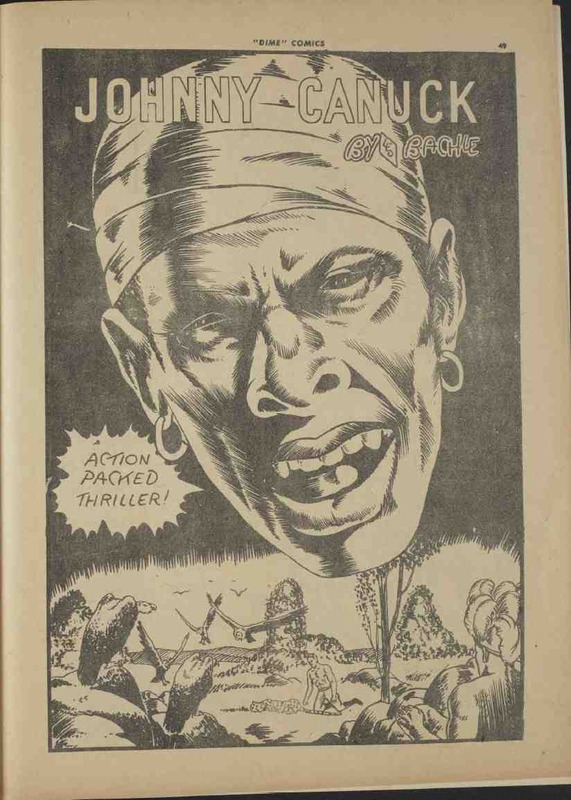 15, a “Johnny Canuck” story, offers even more racist caricatures. The cover page showcases an immense, menacing face, who’s pierced ears and head wrapping betray his foreign allegiance to readers. Based off of this cover page, one might assume the Indian man terrorizing the exhausted hero might figure in the story as the primary antagonist, a villain deserving of such a frightening depiction; however, the character in question appears nowhere within Dime Comics No. 15’s “Johnny Canuck” title (Bachle 32). Why then does he populate the cover page? One can only assume because his racialized visage is meant to project villainy, fear and malice, traits that the artist, Leo Bachle, clearly associates with Indian peoples. What motivated the racist content of Dime Comics No. 15? While the depiction of Japanese soldiers is abhorrently racist, its genesis is not a mystery. In December 1941, the American naval base at Pearl Harbor, Hawaii was attacked by the Japanese air force, and alongside the United States and its allies, Canada declared war on Japan. Soon after the attack, the Canadian government used the War Measures Act—in order to declare each and every Japanese citizen—naturalized, Canadian born and immigrant alike—an enemy alien. Even Japanese Canadians who had served in the Canadian military during the First World War were subject to this draconian law (Fukawa, Hickman 68). Basic rights such as habeas corpus were annihilated by enemy alien status. The Japanese had their finances seized and their agency, already limited by racism and prejudice, entirely revoked. Japanese Canadians were then required to register with the RCMP as aliens (Fukawa, Hickman 72). At the beginning of 1942, the eviction and internment began, as Japanese Canadians were ordered to evacuate their homes and report for detention (Fukawa, Hickman 82). During the evacuation of Japanese Canadians from Vancouver, citizens were held in livestock stables and other makeshift buildings in Hastings Park (Fukawa, Hickman 86). By decree, the Canadian government essentially dehumanized the Japanese in every way—they revoked their rights, their status as citizens, and even kept them in holding areas intended for animals. All of this, not because any evidence was ever produced showing any Japanese Canadians held allegiance to Imperial Japan, or that there was any indication of a threat posed by radicals within Canada, but simply because Japanese Canadians were Japanese. Like the Japanese characters demonized in “West Wewak” and “Scotty MacDonald”, their enemy status wasn’t confirmed by any facts, any actions, their character or their conduct, but by their racial status, they Asian appearance. As vile and reprehensible as they are, the depiction of Japanese people within Dime Comics can be rationalized. The Japanese were the enemy, for geopolitical reasons rather than racial ones, but the conflation of the two is understandable given that the Canadian government quite literally made the same mistake, and with the full power and resources at their disposal, not only treading into racist folly in theory but in action, permanently altering the Japanese population of Canada and leaving scars—financial, racial and yes, physical—that would never fade. The depiction of racialized figures belonging to allied states, on the other hand, offers no such accessible and understandable explanation. India, as a British Commonwealth nation, was an ally to Canada and the rest of the Allied forces. What then is the source for the bizarre animosity directed to both explicit and implicit Indian and Hindu figures? The majority of Hindu immigration to Canada began in the 1960s, with droves of professional Indian men and women, along with their families, arriving to find their place in Canadian society. The majority of Hindu immigration before this time occurred in British Columbia, far from the Torontonian home base of Bell Features comics (Coward 3). The west coast location of the pre-war Hindu immigration did not however prevent institutionalized racism from taking place, similarly to how it would take place decades later. Between 1900 and 1908, nearly 5000 South East Asians, mostly Indian peoples, largely Sikhs but Hindus as well, immigrated to BC. Until 1908, this process ran rather smoothly, but after eight years the small, frightened, racist white population pressured the government into taking measures to combat the imaginary invasion, just as the government would combat another imaginary invasion during the Japanese internment. Legislation was passed in 1908 not only to prohibit South East Asian, and specifically Hindu peoples, from voting, serving in public serving, on juries or as school trustees, professing law or pharmacy, working public contracts or purchasing crown timber, but also to prevent any further immigration through “continuous journey” laws (Coward 8). While it may at times seem random and senseless, the racialization of the South East Asian figures of Dime Comics is not without precedent—precedent laid by the Canadian government itself. The Canadian Whites are as Canadian as any stories come—full of courage, daring exploits, heroism and alliances forged through adversity—but just like the history of Canada, there are negatives present as well: colonialism, racial violence, prejudice and exoticism. The Canadian Whites are spotted, they are flawed, just like Canada itself, and like Canada itself, if we are to move on as a people, we must acknowledge these flaws and seek to understand from where they came and how they might be avoided in the future. Bell, John. “Comics Books in English Canada.” The Canadian Encyclopedia. N.p., 2 July 06. Web. 22 Mar. 2017. Hickman, Pamela and Masako Fukawa, Righting Canada’s Wrongs: Japanese Canadian Internment in the Second World War, James Lorimer and Company LTD., 2011. Coward, Harold G., et al. The South Asian Religious Diaspora in Britain, Canada, and the United States. State University of New York Press, 2000. SUNY Series in Religious Studies. EBSCOhost, ezproxy.lib.ryerson.ca/login?url=http://search.ebscohost.com/login.aspx?direct=true&db=nlebk&AN=44052&site=ehost-live. 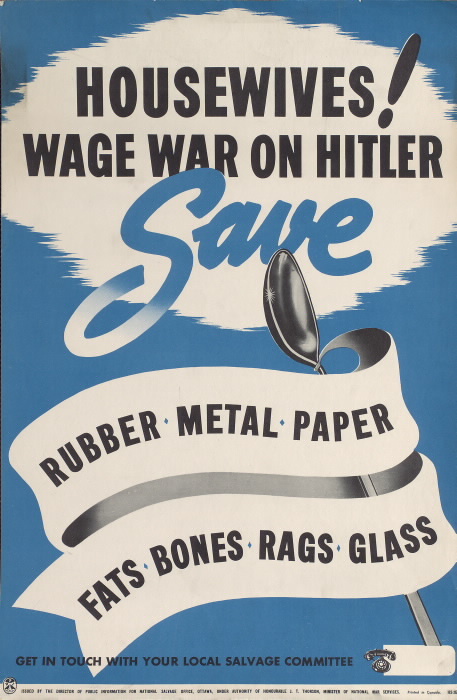 The early moments of Canada’s declaration of war against Germany saw a time of economic turmoil. 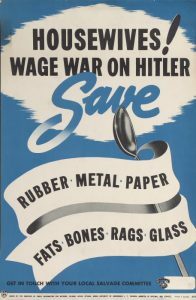 By the end of 1940, the Foreign Exchange Control Board introduced the War Exchange Conservation Act, which essentially banned the import of non-essential American goods, which included comic books and pulp-fiction periodicals, in hopes of conserving the American dollar. (Bell, 30). The American comic-books enjoyed by Canadian children disappeared from the newsstands, leaving a gaping hole in the popular culture of the time. This gap was quickly noticed by children, and just as quickly exploited by the four independent publishing houses that reacted immediately to this business opportunity, beginning what would later be known as the Golden Age of Canadian Comics. First led by Maple Leaf Publishers and Anglo-American, the Golden Age was marked by the onslaught of creative Canadian heroes and stories written by Canadian artists. Amongst these artists and publishers was Adrian Dingle, who had first worked with Hillborough Studies on their only title, Triumph-Adventure, but later joined the brothers Cy and Gene Bell in creating what would come to be known as the greatest publisher of Canadian comic books, Bell Features. 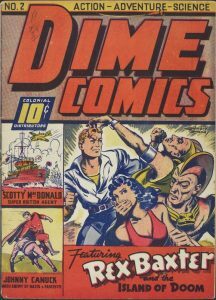 Amongst their several titles was Dime Comics, which ran through the end of 1946. The black and white paneled pages of Dime Comics showcase many stories of bravery and damnation, demonstrating the complex creativity that was born during the war. Issue No. 23 of Dime Comics was published in October of 1946, little more than a month after the war officially ended. The issue includes full-length comic stories, shorter spreads, and direct insight into the world that inspired the fictional stories. Amongst the themes that we see in this particular issue is that of the idealized masculinities embedded in the stories of superheroes, promoting a framework of stereotypical hegemonic masculinity that was both a standard to which the men of the era were held and a dream that adolescent readers aspired to become. “…Hyper-masculinity is the most visible and most mute way of responding to the anxiety generated in the North American male’s search for masculinity” (1103) writes Klein, author of the journal article, “Comic Book Masculinity”, in which he discusses the links between body-builders and internalized misogyny and homophobia. In addition to their valiance, the superheroes must also fit a certain physical type. Each of the men is broad-shouldered and chested, with a strong jawline and chin; they are young and handsome and ready for action. A strong build was one of the physical demands of war-time strength. 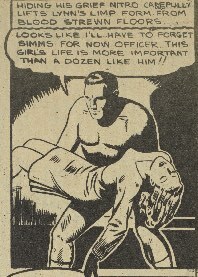 Even in the case of exhaustion, as we find Johnny Canuck in during his kidnapping, the male superhero is always ready for action, Terry Allen is instantly prepared to become Nitro and save the day, Drummy Young is immediately ready to engage in physical combat with the enemy; their bodies work in their favour and are undeniably strong, flexible, and healthy. “There seems never to be a hesitation or a backward glance: the superhero knows what he has to do, even if this implies only being on the move—performing, in a word,” states Yann Roblou (79), discussing the hyperbolic activity of the male superheroes’ body. No matter the situation, the heroes are never to be seen as fazed in their speech or in their body language. Comic book masculinity also extends itself to expectations of male vitality: they must always be ready for combat and be above feeling pain. Indeed, even when Johnny Canuck succumbs to pain and fatigue, he is revitalized by the end of the page and announces that he is ready to “take another crack at the Japs.” (Bachle) While exhaustion and fatigue are felt by the superhero, he must be quick in recovery and be ready to continue his duties. 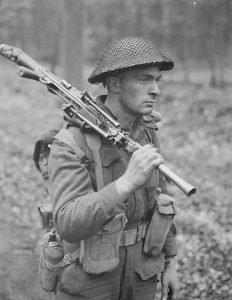 The Faces of War collection at the Library and Archives Canada depicts the male soldiers of the Second World War, all of whom have the same strong build and vitality that we see in the heroes of Dime Comics. The physical build was a reality as much as it was a fictional depiction, though the comic book drawings were a hyperbolic version of that reality. Rex Baxter, the “United Nations Counter-Spy”, leads his squadron through the air and is faced with the threat of new invasions from Hitler. Nitro, the second hero that we see, is the alter-ego of Terry Allen, a patriotic Canadian shown buying war bonds with his fiancée, Lynn, when the bank is robbed. Terry Allen turns to Nitro, determined to save the day, whilst remaining a concerned fiancé and leaving the crime-scene with Lynn when she is shot. Drummy Young, a model citizen, realizes that a radio-show host was a Nazi spy, using his platform to provide Nazi forces with the latitudes and longitudes of ships at sea, thus enabling their attacks. Drummy stops the “bad guy” on time, preventing further harm to Canadian servicemen at sea. 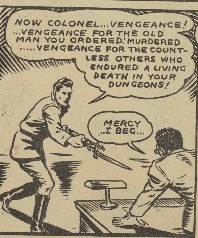 Finally, we see Johnny Canuck, weakened in an enemy dungeon, but watch as he escapes, avenges the death of his prison-mate and seeks vengeance for the lives of all those who “endured a living death” in the dungeons. It is interesting to note that while not all these characters are military men, per se, they clearly demonstrate the making of soldiers, in their particular strength of character, sense of justice and moral integrity. Perhaps it could be said that their remarkable feats of bravery were meant to demonstrate to children the power of the ordinary citizen- that by being vigilant and active, they, too, could play their part in the war. Hourihan writes, “the hero’s task is to defeat the forces of chaos, fear and ignorance and so ensure the survival of the state, the realm of civic order and rational behaviour.” (88) This concept is evidenced in the characterization of each of these ultra-male superheroes; they are meant to act as defenders of peace and protectors of Earth. Rex Baxter tackles the peculiarity of seeing strange planes in the sky with a cool-headed approach, a curiosity and a strong sensibility of the possibility of danger. Johnny Canuck, fatigued from his capture and time in the enemy dungeon, still recognizes his moral responsibility to avenge the deaths of his prison-mates, and, once he escapes and is reinvigorated, is immediately ready to reengage with the enemy soldiers. 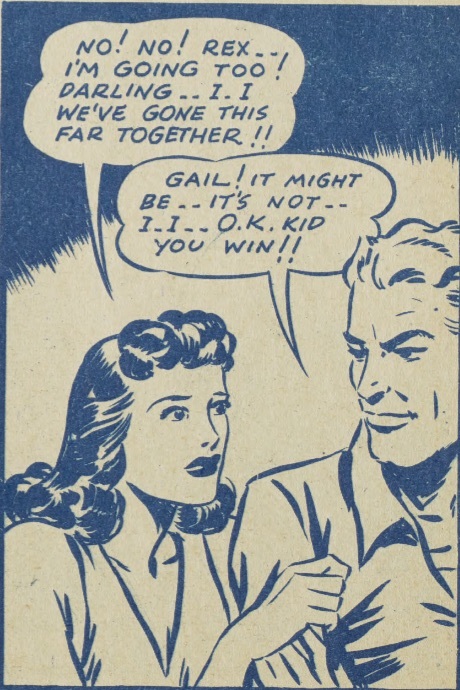 Panel from “Nitro” Dime Comics, No.23 October 1946, p.15. Drummy Young does not have explicit ties to the military in the same way that Rex and Johnny do, but, by being a vigilant citizen, Drummy finds the Nazi spy amongst a group of radio show hosts and saves the lives of hundreds of servicemen at sea. When the bank is robbed while he is buying war bonds with his fiancée, Lynn, Nitro rushes to stop the heist until he turns to find that she has been shot. At that point, he exclaims that “this girl’s life is worth more than a dozen like him!” (Latare) and leaves in order to find medical help for her. Nitro presents a duality of masculinity, conflicted when faced with a situation in which he must act as savior both to the masses and to his fiancée, Lynn, and is ultimately rewarded when he must fight the robber to obtain a blood sample for the transfusion that Lynn needs to survive. This determination to save the day, the careless disregard for one’s own well-being, and the unwavering faith in their own goodness and conviction in the causes they fight for characterize our heroes, and our expectations of Canadian men. Our saviors fit the characteristics of being tall, muscular, conventionally attractive white men who seek protection for those that are weaker than them, placing the safety of women, children, and the elderly above their own needs. Furthermore, the dominance of the white, muscular, heterosexual male superhero is asserted when he is placed against the backdrop of immoral characters and apathetic women, who play foil to his excellence. Within the black and white pages of Dime Comics, the hero exists in a metaphorically black and white moral binary, where he is the unequivocal force of goodness in a world that is populated by petty thieves, Japanese enemy soldiers, and Nazis. As such, we begin to question exactly what differentiates our male hero from the antagonist, when they both engage in violent behaviour in the defense of their causes. The simple answer is that the heroes we follow, Johnny Canuck, Drummy Young and Nitro, (as we do not see Rex engage in combat with anyone) truly believe that they are protecting the weak as they fight. The more complex answer would be that the artists and writers have their own ideological biases that bleed through their stories –the masculinity that is acceptable is that which is in accordance with the commonly held values of the Canadian people, and through the blatant othering that is present throughout the stories, we are made to believe that the superheroes are dispensing justice. Additionally, the women that are placed around the men serve little more purpose than props or plot devices, such as where Lynn distracts Nitro from his work saving the bank and Gail Abbot, Rex Baxter’s girlfriend, exists in the background as he expounds on the conflict. We find the men in drawn as unquestionably more intelligent and interesting than the women around them, and continue to read them as such. The men exist, then, as unequivocally good because they are never confronted with their equal opposites, only men who are meant to be read as evil and women who are purposefully written as unintelligent. While the truth of the matter is that the Canadian superheroes were fighting to protect the weak and the helpless, it cannot go unstated that “such figures are not helpful role-models for ordinary boys and men who are full of normal imperfections, who must live in a mundane world where there are no unequivocally evil enemies to fight against…” (Hourihan, 72). The comic book hero exists in a vacuum, there is no goodness but him and he has little evil in him, at all. Bell Features Collection, Library and Archives Canada. However, this does not negate the fact that these heroes were role models to children both during and after the war. They stood as symbols of patriotism, created by artists specifically for the purpose of providing Canadian children the same patriotic heroes that American superheroes were for American children. 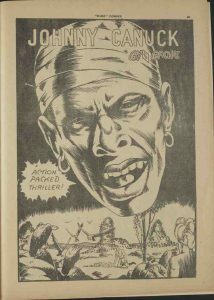 As narrated by John Bell in his book Invaders of the North, Johnny Canuck was created by a fifteen-year-old Leo Bachle, who amused a Bell Features investor with his criticism of the artwork of some of the Bell Comics. (50) Upon request, he showed the investor some of his own artwork and was hired the next day as a freelance artist for Bell Features, soon creating Johnny Canuck, who stands to this day as a symbol of patriotic Canadian heroism. Johnny Canuck was a hero who constantly came in contact with Hitler, frequently “slugging the Nazi dictator”, and in essence, became a catalyst of wish-fulfilment for many of the children who had to watch the war from home. Despite the aggression and structured expectations that the comic books seemed to be setting forth, that the heroes also presented themselves as a means through which the child-readers were allowed to partake in a war they had to see from the sidelines is undeniable. It is also undeniable that the heroism and war-like behavior of the comic-books was an exaggerated, over-sentimentalized versions of what war-time masculinity should look like. Neither of those facts override the other but exist simultaneously as the context which created the comic culture of the time. The stories of Rex Baxter, Nitro, Drummy Young and Johnny Canuck portray a double-ended societal expectation and youthful desire to be the hero of the war. These heroes exist because they were needed, in the way fiction is, to comfort, appease, enlighten and intrigue children, although not necessarily to teach them the realities of war as it played out for soldiers on the home-front. They portray the aggression and masculinity that was deemed appropriate for the time, channeled, unfortunately through their hatred for the “others” and the sense of masculine superiority and dominance that exists within the stories; but there remains the fact that the heroes and their worlds provided a sanctuary in which Canadian children could dream themselves into super-heroes and military men, fight alongside their fathers and brothers and make their way towards a victory. Bell, John. Invaders from the North: How Canada Conquered the Comic Book Universe, Dundurn, 2006. Hourihan, Margery. Deconstructing the Hero: Literary Theory and Children’s Literature. Routledge, 1997.